A motivational speaker is any professional speaker whose purpose in speaking is to motivate or inspire the audience he/she addresses to begin or to persevere when engaging in a specific activity. The action that the speaker attempts to get his listeners to take part in will vary greatly based on the speaking occasion and the organization that hire him, but there is always the goal of clarifying the value of some endeavor and encouraging people to take the steps necessary to accomplish that endeavor. Speakers who are knowledgeable in their particular area of expertise, passionate about communicating that knowledge, and skilled at speaking to and motivating an audience often are sought out to be motivational and/or keynote speakers at various events. Those how have something unique to say, an interesting or challenging way of saying it, and a clearly thought out goal in saying it, often choose the career path of motivational speaker. In general, motivational speakers are valued because they possess the ability to make lofty goals seem reachable, instead of nearly impossible. They also are skilled at clarifying complex ideas and issues so that they are easily grasped and found meaningful by their listeners. Hard study, long experience, life backgrounds, and a good dose of creativity are all a part of being a successful motivational speaker. The goals that these speakers aim at can be related to self-improvement, community service, school or church involvement, educational achievement, business success, or any number of other areas of corporate or personal life. 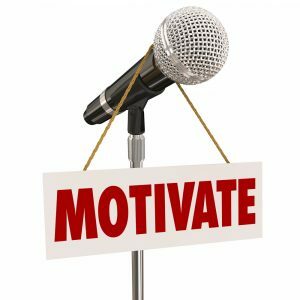 Perhaps the most useful way to delineate “types” of motivational speakers is by filling in the following formula: WHO is being motivated to do WHAT and for what PURPOSE (WHY)? While there is not “official” educational standard for a motivational speaker, there are many training opportunities where such speakers develop their talent. Speakers may gain valuable experience speaking at non-profit or volunteer organizations, take special speaking classes through groups like Dale Carnegie or Toastmasters, or gain a “Certified Speaking Professional” credential from the National Speakers Association. Besides training and experience, motivational speakers must devote significant time to topic development. It is not only critical that the speaker be a true “expert in his/her field” but that he learn to organize and transpose relevant information in “speech form.” Some may prefer to do this on paper, while others use a recording device, but the important thing is that high-quality content be developed for each audience to be addressed. Delivery of developed content is as important as the content itself for motivational speakers. The “way” it is said can make the message more memorable, more relevant, more “motivating.” Top speaking talent will pay close attention to cadence, pace, pauses, volume, humor vs. seriousness, repetition, emphasis, and more to deliver the content with its maximum possible positive effect. The logistical aspect of being a motivational speaker is also important. Usually, this is handled by an agent or a professional speakers bureau. There are contracts to be negotiated, travel and accommodations arrangements to be scheduled, and (often) “post-event events” like book signings or question and answer sessions to consider. Speakers bureaus help provide motivational speakers with a steady stream of work opportunities and make it easy for those seeking a skilled motivational speaker to find one quickly. These speakers often talk on family or spiritual topics and seek to motivate listeners to take concrete actions in their lives that will lead to personal betterment and fulfillment. The means of communication may often be through stories of how the speaker him or herself overcame obstacles and achieved success in life. Oftentimes, there is little overt stating of “do this or that,” but the listener is expected to find the applications to his personal life on his own. Youth are a major “special target” of many motivational speakers who address schools and colleges, church youth groups, or any number of youth organizations like the YMCA or 4-H. The goal is to instill in young people a sense of purpose and hope. Since the future generation will determine the course of our whole society, these speakers focus on motivating youth to pursue higher education, enter challenging career paths, develop healthy relationships, and adhere to a high moral code of conduct. Businesses often hire motivational speakers to address their workers. Typical goals include: teaching employees to work well together as a team to achieve a common goal, encouraging lower-level staff that it is possible to rise to leadership through hard work, and encouraging workers to see the value that their employer contributes to the community at large. The speaker will need to share expertise at group motivation and knowledge of specific industry niches, and he will often share an encouraging story of how he rose through the ranks to become a business leader. Speakers with a religious and/or community service theme will emphasize the good we can do for our community or the importance of faithfulness to a divine calling. There will often be specific issues that are tackled, such as missionary efforts, world poverty, or environmental awareness. Other times, the immediate goal might be a fundraising campaign to fund a new building project or outreach project. In some way, shape, or form, this kind of motivational speaker tries to motivate the audience to take specific actions that will lead to improvements in the lives of others. Motivational speakers come in nearly endless variety, and they have different ways of accomplishing their goals. However, the overall goal still remains the same: to encourage the audience to take specific actions that will have positive results in their own lives or in the lives of others.